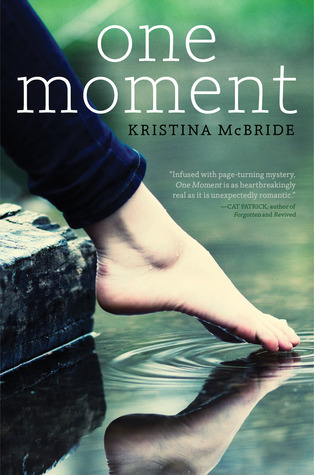 One Moment by Kristina McBride is a story of the unfairness of life; how things are cut short, how things are not what they seem, how things are stolen, changed, a path diverted in a blink. Maggie and her friends are at the gorge. Maggie and her boyfriend Joey are at the top of the cliff, about to jump off — then everything goes blank. Maggie opens her eyes and Adam is urging her out from the bush she’s hidden herself behind. There is screaming, sirens, and blood. Joey is dead. The story goes on as Maggie and her friends deal with their loss, as Maggie attempts to piece together her final moments with Joey in the hopes of figuring out what, why, and how it all happened. But it’s not all it seems. Along the way, Maggie discovers secrets that threaten to sever the friendships, and distort the image of Joey from her heart. This book begins with Maggie describing Joey’s lopsided grin, and the soft texture of his hair; the daring glint in his blue eyes, and the smooth surface of his muscles. Naturally, I groaned. But. This was surprisingly well-written — in great conflict to it’s frightening start. I mean, it’s still there. Maggie observes hair, eyes, skin, smiles of everyone and everything. She describes Joey as her be-all and end-all. But I just rolled through those like a boss — you learn. Despite that, One Moment was complex. Its characters were well-roundedly flawed. They were guilty but sympathetic — not an easy feat. The friendships between Maggie, Joey, Adam, Shannon, Tanna, and Pete were relatable: supportive, yet occasionally tense; caring, yet not overly selfless. They loved each other, but they’re teenagers and so at times loved themselves a little more. This was part teen drama, part romance, part mystery, part crime thriller, part psychological study. It flowed well, with the narrative going back and forth between the aftermath of Joey’s death, and the events leading up to it. It was neatly balanced; as readers, we are interested in both timelines. Nice, though, it was, it was not entirely mysterious. Case in point: p. 37. P. 37 is when I figured it all out. It really isn’t all that, being clever, you know. And the secrets are a little too predictable, though, if I may say so, not totally transparent either. There is a good diversion that leads you one way — but then it all comes back together and you’re wit is proven in troth (applause). So to clarify, most of the “usuals” are there, it’s the way they are told that is refreshing. What really impressed me about the book is not the characters themselves. Although I did quite enjoy them…so much so that when the secrets did surface, I felt the betrayals personally. As if I were a member of this tight-knit group and that it had also happened to me. Thumbs up. Anyway, what I liked most was the overall presentation of the imperfections within us. These characters have done wrong, and while you may want to judge them on impulse, you can’t because their sides and confessions are fleshed out. They simply suffer from immaturity, selfishness, panic, confusion, what have you. They show good parts, and bad parts, and suddenly your finger isn’t as quick to point. I liked all this — unless I’m being a little too forgiving…which I hope I’m not. I enjoyed the book. It evoked a reaction from me. It isn’t the most profound read, it isn’t the most emotional. But if you want to feel just a little bit sad (am I the only one who goes through these moods, where I actually want to read a book that will depress me? ), then read this. It won’t dampen your whole day, but if you want to be hurt just a tiny bit, then this is good enough. The last section of the book, however, is its weakest part. It ended too neatly. They stained a character a touch too dark; there were closures I didn’t quite get; the continued dwelling over Joey’s death and Maggie’s love for him took up too much space (I mean that gently); and a particular resolution was too swift, too happy. I felt like that last part detracted from the grave depth it had going; it subverted everything it had been working on the entire time. It’s like it had this potential of being more than a teen drama…then it tricked you, it is a teen drama! Also, physical descriptions. Sometimes I prefer if characters aren’t given physical attributes. Just let their personality come through, let that be the paint. Characters are feelings for me. When I read, it’s the feelings I get when a name is mentioned that’s more powerful than any physical description. When you have to constantly re-visualize a character, it takes away from the flow of focus. Am I babbling or is there someone out there who get what I mean? It’s just easier to hear a name and instantly feel something, rather than hear a name and then concentrate on what they look like. Alas, only the very skilled writers have achieved this for me. Long story short, I recommend it. At the very least, it won’t piss you off. Ciao. Thanks for the honest review, Wendy. I liked this one but thought it lacked a spark. And I know exactly what you mean about the imperfections of the characters! That looks neat. I’ve seen it popping up all over on blogs and so It’s good to see a review! Thanks for that! I have heard the most amazing things about this book and intend to get myself a copy very soon! I like that it inspired emotions in you and that you really connected and had a real reaction! It’s a shame the ending wasn’t so great, but hey, that can’t all be perfect. I have a copy of this from NetGalley and was thoroughly scared off by a few reviews… its my next read and I’ve put it off because I heard it was “just okay” and depressing. Now I want to read it. Thanks for the great review to get me motivated! I like the sound of this one, but I have to admit…I tend to have this uncanny ability to figure out most “mysterious” plot lines way before they’re resolved in the book, which always leaves me feeling a little letdown by the end of the story. If you figured it out by page 37…well…I probably won’t be picking up this book for that aspect. Still, the characterization that you mentioned intrigues me. It might be something I’ll give a shot in the future! To feel emotions personally… Well, besides the characters, that makes the book. If you can’t feel, then there’s no point. What do you really get out of it? Interesting. I might just read this one now. Oh, you should! I know its not on everybody’s radar but it was a really nice treat. I read and posted a review of this last week, and I’m glad that you also felt the betrayals just as strongly as I did. For me, that was definitely the strength of this book. It was amazing, how I could feel everything that happened just so strongly. You wrote a really great review! it sounds interesting, all these things mixed in one book. it always intriguing. thanks for the review, I didn’t know this one. Yeah, this book isn’t as “anticipated” as others, but I thought it sounded good and deserved some attention. Hope you love it, Melliane! Great review, K! I wasn’t sure about this book but it sounds like it is worth the read. The characters sound like they will be good to meet. I don’t think the end will upset you, I just think it could’ve been really painful, but instead it decided to be a bit of a happy ending. Which I think under the circumstance, the characters probably deserved. Enjoy, Jasprit! Lovely review, K! I have this on my Kindle and I’m hoping to get to it soon. I understand what you mean about characters without descriptions, I don’t need them and if they’re constantly described I feel like I keep needing to re-imagine them when I’ve already picture them the way I want to! Hah exactly! We picture them the way we want to picture them anyway, right? Especially the guys…when I read the word “blond”, I just pretend I didn’t.